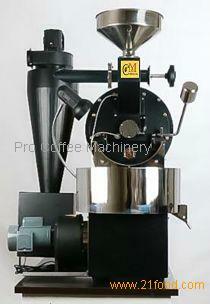 Automatic gas roaster for coffee roasting. 2 kg roasting capacity per cylce. Max 8 kg roasted beans is achievable by a hour . steel drum and steel cool tray. built with metal body , any colour on demand. complete steel body is an another option. Comes with cyclone as free of charge. This is table roaster. Steel / metal table is seperate and provided on order against additional charges.